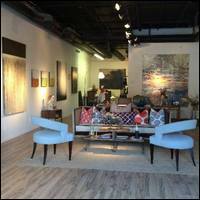 Muse & CO. Fine Art (formerly Timothy Michael Gallery) was formed in September 2010 near historic Roswell by three women with a passion for art. The gallery strives to provide the highest quality contemporary fine art. Presenting and promoting both emerging and established artists, the gallery has an emphasis on exhibiting painting and sculpture, as well as hosting performances. Muse & CO. Fine Art also offers advisory services to collectors and artists.